Steig Larsson is now recognised as a great Swedish author with a very popular trilogy of books that have sold countless millions and been filmed by his home country and now in the process of being remade by Hollywood. Sadly Larsson died unexpectantly in 2004 after delivering the initial manuscripts for what has been titled The Millenium Trilogy and thus never got to see the phenomenon that his work would become just a few years later. 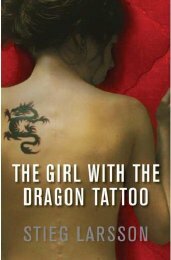 The Girl With The Dragon Tattoo, the first of the trilogy, introduces us to central characters Mikael Blomkvist and Lisbeth Salander. Blomkvist is a journalist with current affairs magazine Millennium, whilst Salander is a bit of an awkward character who just happens to be an expert hacker and researcher. Blomkvist is in huge trouble after his magazine published a story of his relating to corruption by powerful industrialist Hans-Erik Wennerstrom. Losing the inevitable libel trial, heavily fined and sentenced to a future jail sentence, Bolmkvist is offered an escape from public attention by industrialist Henrik Vanger. Salander, meanwhile, is only linked to Blomkvist via initial research on Blomkvist requested by Vanger and has a very complicated private life. The central mystery that hangs over Vanger is the disappearance of his niece Harriet in 1966. Murder is suspected but unproven as no body was ever found and the mystery may well have stayed in the past but every birthday Vanger receives a pressed flower in a frame, the same as Harriet used to give him. Vanger offers Blomkvist a year long contract to examine the mystery and see if he can find something where both he and the police were unable to come up with any concrete answers. The bonus for Blomkvist is that Vanger promises to provide information on Wennerstrom that Blomkvist can use against his nemesis. As with Dan Brown's novels, I came to Stieg Larsson's trilogy late - only picking up the set just before Christmas, initially as a present but then deciding to keep them for myself. Why? Well, I'd already seen the first Swedish film and been rather impressed and had the second on pre-order for release this week and thought it was about time to see how much was about to transition to the big screen. Actually I was quite impressed with how much they managed to fit into the film, but more impressed by just how smoothly the story flowed along with the overall sense of isolation and intrigue - and it is quite a complicated story really when you try to break it down. I'm more annoyed really that I didn't really give this chance when I first heard of it, having already read some of Henning Mankell's Wallander series. Overall you have to be impressed with the depth of this work covering as it does elements of the Swedish economy as well as social and media sections of Swedish culture. Larsson's characterisation for his main characters is pretty in depth, so you get a real sense of what makes them all tick and really do care what happens to them. I'm pretty sure that this was his first foray into novel writing and despite the fact we won't get to read anymore past the three books in the trilogy, Stieg Larsson can be quite proud of what he has left us to enjoy. I can only hope the next two books are as impressive as this one.